In a bowl mix together maida, salt and oil nicely using finger tips. The flour should be well mixed with the oil. This is done to get crispy samosas. Then add ajwain & water little at a time and make stiff dough. Cover it with a damp cloth (to prevent it from drying) and let the dough rest for 20 minutes. Pressure cook potatoes, peel the skin and cut it into cubes or mash it slightly. Finely chop onions, adrak and hari mirch. Heat oil in a pan, add jeera seeds, when it sizzles, add onions, adrak, hari mirchi and saute until onions turn transparent. Then add dhaniya powder, haldi powder, chilli powder, jeera powder and salt as needed. Mix well, cook for 2-3 minutes. Add cubed potatoes, dhaniya leaves and mix well. Turn off the gas. Add few drops of lemon juice as per taste..
Make balls from the dough depending on the size of samosas needed. If you want a small samosa, make a small ball and a slightly bigger ball for a bigger samosa. Now take a ball of dough and roll it out very thinly in an oval or round shape. You do not have to be too perfect. Cut it into half. Now wet the straight side with little water using your finger tips. Fold it in such a way that you get a cone. First bring one edge to the center, then bring the other edge and place it overlapping the first. You get a cone. Fill the cone with potato stuffing. See to it that you fill even the tip of the cone. Now wet the circumference of the cone with water using your finger tips for sticking. Stick together and fold it. If there is excess length at the back, you can make a pleat and then fold it to form a triangle. Make it sit and shape it nicely. Now repeat the same process for the rest of the dough. Now heat oil in a pan. To check if the oil is hot enough, drop a small piece of dough into the oil, if it rises to the surface immediately, then the oil is hot enough to fry the samosas. Now reduce the flame to medium and maintain the same oil temperature throughout frying. Drop 2-3 samosas into the oil gently and fry both sides until golden brown. Fry the rest of the samosas in the same way. Soak excess oil with kitchen tissues. 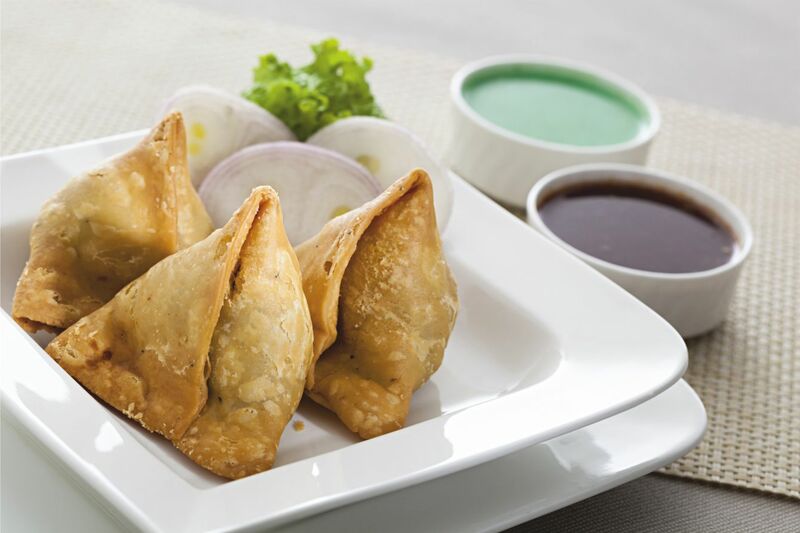 Serve Samosa with green chutney or tomato ketchup.